Roughly 5,500 new real estate agents and 1,100 new brokers received licenses from the California Bureau of Real Estate (CalBRE) in the first quarter (Q1) of 2017. The number of new agents receiving licenses in Q1 2017 was slightly higher than a year earlier, when about 5,300 agents were newly licensed. At the same time, the number of new brokers was also slightly higher than Q1 2016, when just under 1,100 brokers were newly licensed. Broker licensing is slower and steadier due to the difficulty in obtaining a license. Further, tepid sales volume has stunted the growth of newly licensed brokers, which has increased at a slower pace over the past year. Established agents looking to remain in the business and upgrade their licenses know today’s flat-to-down sales volume as compared to last year paints a much different picture than media reports of annual price rises. A total of 133,800 individual brokers and 279,500 agents held licenses issued by the CalBRE at the end of Q1 2017. As home prices falter in the second half of 2017, expect licensing for sales agents to drop off slightly following the price drop, and bottom in 2018. 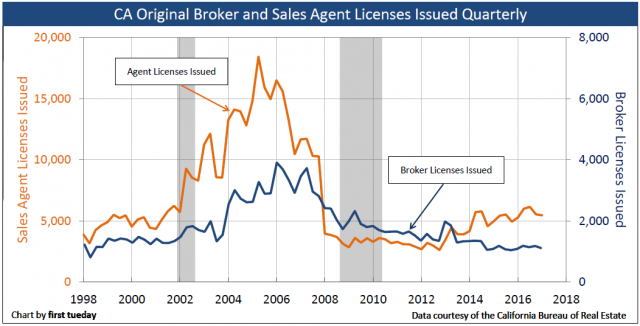 Meanwhile, new broker licensing is expected to remain stable through 2017. Both broker and sales agent licensing will see a substantial increase with the onset of the forecasted boom in real estate sales volume and prices, anticipated around 2019-2021. Updated May 18, 2017. Original copy released November 2008. Compare the number of newly-licensed California Bureau of Real Estate (CalBRE) brokers to the number of newly-licensed CalBRE sales agents and you find that for every five new agents there is approximately one new broker. New brokers come from the ranks of current sales agents and other real estate related professionals. Importantly, between 10% and 25% of newly-licensed sales agents go on to become brokers, varying depending on when during the real estate cycle they become licensed. These licensees are most likely to become brokers within four years after first getting their sales agent license. Those who are not initially active sales agents can still qualify to become brokers by virtue of education or profession. Read more about CalBRE’s requirements to apply for a broker license here: Requirements to Apply for a Real Estate Broker License. Find out how licensing courses work here: CalBRE approved Broker Licensing Courses. The current ratio of total sales agents to brokers of 2.5:1 is a remnant of the abnormally high number of sales agents flooding into the profession in the 2000s back to historic norms. However, since Q2 2014, optimism due to rising prices and low mortgage rates has boosted sales agent licensing to the level experienced just before the Millennium Boom jump of the mid-2000s. Through most of the mid-2000s, until the legislated real estate licensee crash in October 2007, a ratio of five new sales agents to every one new broker became the boom-time standard, which we are once again approaching. This ratio however was unsustainable, fueled by an artificially high volume of home sales, hyper-inflated home prices and rampant speculation by flippers who sought to take advantage of the momentum. 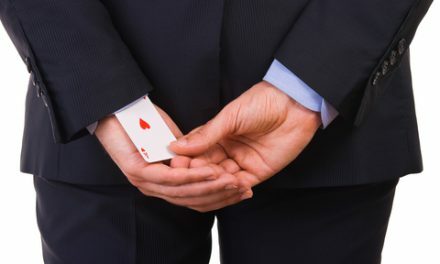 Now, in the absence of the market distortions of the housing boom, the real estate profession is moving toward a more natural balance between the quantity of brokers and their sales agents. Speculation peaked in 2013 and continues to subside. During the 2000s, the timing of the rise and decline in the number of new brokers followed one year behind the rises and declines in the number of new sales agents, as is illustrated by the above chart. Based on current licensing numbers, we are able to safely predict that the issuance of new broker and sales agent licenses will remain low until approximately 2018. Broker licensing has historically been far more stable than sales agent licensing, but it can still be forecasted by an appraisal of the number of new sales agent licenses issued during the prior four years. altered licensing requirements effective October 1, 2007, when the state severely tightened requirements for sales agent licensing, instantly causing the number of licenses issued to drop 80% to the more sustainable current level. In Q4 2014, sales agent licensing fell back slightly, but regained momentum going into 2015 and has continued to climb to today’s number of 5,500 new licenses issued quarterly. Expect sales agent licensing to taper off in mid-2017, as home prices begin to decline. 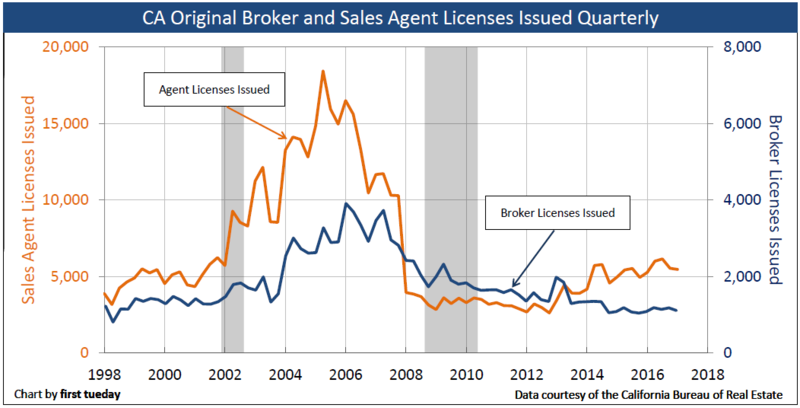 Meanwhile, new broker licensing numbers appears to have bottomed as of Q4 2015 and will remain stable as the entire licensee population corrects for the current surplus in licensees. Both broker and sales agent licensing numbers will remain stable in 2017, then begin to rise once again as the housing market starts to show signs of real recovery, first through an increase in sales volume, then an increase in prices one year further on. Roughly 60% of new sales agents who were issued licenses from 2005 to 2007 have left the real estate profession by letting their licenses expire at the end of their first four-year license period. Further, one-third of all sales agents who renewed their licenses are not employed by a broker and thus not involved as sales agents in real estate transactions. Accordingly, around one-third of the 99,700 individuals who received original sales agent licenses in the two years prior to October 2007 will be actively participating as sales agents in real estate transactions in 2016, while the California real estate market continues to stabilize for an eventual upturn in sales volume around 2018. Of the 33,250 licensees remaining after entering in 2006 and 2007, around 6,500 have already become brokers. However, the new sales agents who entered after 2007 are of a different mindset and possess different talents than the “hit-and-run” types who entered between 2003 and 2007. This incoming batch is more dedicated and thus more likely to plan ahead for long-term market rises and falls. Their actions will cause fewer future entrants to drop out after their first four years, a human resources problem the real estate industry has never managed to control. 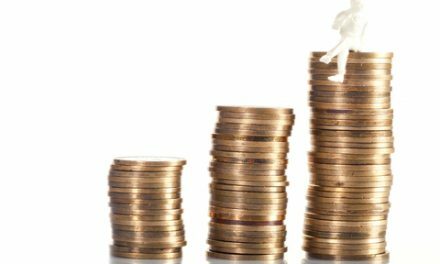 Many will be from families that own investment property or have brokerage backgrounds, and they will enter for far better reasons, and with much better likelihood of success, than those who merely hope to get rich quick. Sales agents who have upgraded to broker status, presently around 4,600 annually, have already found their sea legs in the real estate industry. Thus, most of them will remain actively employed by, or in association with, other brokers during the continuing bumpy plateau recovery. second, the percentage of sales agents who renew their licenses is likely to jump, thanks to a current shadow force of underemployed licensees. At present, roughly 15% to 20% of all real estate sales agents allow their licenses to expire annually instead of completing the continuing education requirements and paying the fees required to retain their licenses. As the economy shows real signs of recovery around 2018, this percentage will stabilize at approximately 25%: a level common during the more stable years in the late 1990s. The license renewal rate for brokers is expected to continue unchanged, at around 85%. The number of newly-issued sales agent licenses will slip in 2017 before rising again, as the market goes first into a calm following government stimulus and speculation. New issuance of real estate broker licenses is expected to remain around 4,500 new licenses annually in 2017. Sales agent licensing will remain at or below its present low rate between 20,000 and 23,000 annually in 2017.
first tuesday forecasts that licensing volume — that is, the total number of real estate licensees holding either a CalBRE-issued sales agent or broker license — will decline in 2017, and begin to rise gradually in 2018 and more significantly in 2019. In 2018, the total number of real estate licensees in California will be at its trough of approximately 360,000, but could justifiably drop to 350,000 (the total count in Q4 2016 was 387,300). The most recent past low point in total licenses in California was 1997 with just under 300,000 real estate licenses. Since then, the resident population has increased by about 1% annually, also suggesting a licensee population of 360,000 agents will be the low point in this recovery. In the more immediate future, inactive real estate licensees (licensed sales agents not currently employed by a broker, and licensed brokers who elect not to use their licenses) will gradually begin to return to active status as sales volume stabilizes and sales agents begin to improve their income flows. 2018 will be the “go-ahead year” for the California economy. The state reached pre-recession employment levels in mid-2014 exceeding the previous historic high of 15,348,200 jobs experienced in December of 2007. Employment growth remains strong going into 2017. As a result, the demand for housing among “employed homebuyers” will begin to rise with the increasing numbers, but will not drive sales volume to the heights of mid-2005. However, demand will be too great to be met by existing housing. Thus, builders will need to increase their construction activity to meet the demand. Construction and home sales will be most intense in California’s urban cores, where the population will increasingly concentrate itself. Indeed, unless cities relax their land use restrictions – density and height – and permit construction sufficient to keep pace with the increasing and shifting demand, home prices will rise faster than the rate of consumer inflation, at speeds unsustainable in the long term. Another period of boom and bust (around 2020) is not unlikely. Rentals: the future of California real estate? Beginning in 2018, home sales volume will begin to pick up in earnest, peaking in 2019-2020. An ongoing increase in the popularity of rental housing will take the pressure off the demand for new single family residential (SFR) housing going into 2017. And until buyer demand for new housing is reflected by annual increases in construction starts, real estate licensing and renewals will have no urgency. These mid-decade shifts will be dramatic, and easily observed by real estate professionals. After all, the increase in licensees will only reflect what will, by that point, already be obvious: increased home sales volume and the ensuing increase in home sales prices roughly nine months later, when pricing will finally begin to rise more quickly than the rate of consumer inflation. Although this recovery has been mired with unsustainable bumps — first from the 2009 stimulus and then from speculator over-activity in 2012-2013 – the number of annual home sales will eventually begin to rise at a steady and sustainable rate, and sales agent licensing volume, like home pricing, will rise in response. 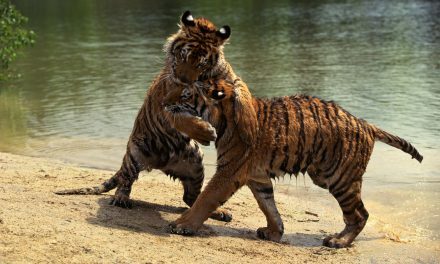 Are your buyers motivated by animal spirits? This report gave me information which is important to me.and I will maintain and keep my brother license active in California. Just renewed mine but keep in mind that many, like me, don’t use their license for sales or lending but for purposes of property management and commercial leasing. Data on where the licenses were issued would be useful: city, county, metropolitan, etc. Any trend data on the sales and broker exam pass/fail rates over this time period?